Passengers on a plane on June 23, 2013. The past couple of weeks have seen a spate of confrontations among air travelers over reclining seats. This shouldn’t come as too much of a surprise, as flying has become a somewhat stressful undertaking. A cramped, pressurized room full of cranky people is a recipe for quibbling over anything. The social contract involved in flying is nebulous, and one potential source of the strife in the skies could be that people vastly disagree about what’s considered rude. To find out what people actually consider rude, we ran a SurveyMonkey Audience poll Aug. 29 and 30, and asked air passengers what’s cool and what isn’t. We had 1,040 respondents, 874 of whom had flown. Let’s first tackle the question of reclining seats. Of 858 respondents, 16 percent always recline, 20 percent usually do, 14 percent recline about half the time, 30 percent do only once in a while, and 20 percent never recline. This is a remarkably even split. Half of respondents recline half the time or more, half of respondents do it once in a while or never. So, we’re at a bit of an impasse here. Only 41 percent of respondents thought it was very or somewhat rude to recline your seat during a flight. Most people (70 percent) said they would not eliminate the option to recline seats on flights. But most people (64 percent) also said passengers should not recline if the flier behind them asks them not to. The rest of them said a passenger has no obligation to the person behind them. We also asked people about common aggravating behaviors on flights to determine whether those actions were very rude, somewhat rude or not rude at all. Waking up a passenger so you can leave your seat can be interpreted as either very or not really rude; it’s about intent. Only 37 percent of respondents thought it was rude to wake a neighbor if you need to use the bathroom. But if you’re just trying to stretch your legs, disturbing someone’s slumber is considered impolite. And while it’s not considered super impolite to ask to switch seats, more people are OK with it if you’re moving toward a relative than a buddy. 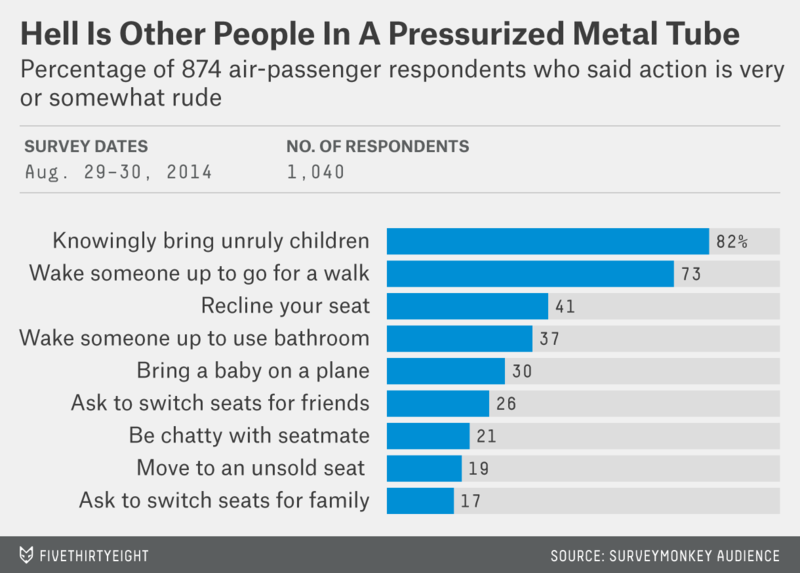 I was surprised at how many folks thought knowingly bringing unruly children on a flight was rude — a whopping 82 percent. Passengers were much more charitable to babies. Interestingly, people’s responses to questions about kids depended a lot on whether they had children younger than 18. Only 21 percent of 188 parents thought bringing unruly children on a plane was “very rude,” compared to 47 percent of the 657 people without kids. Passengers without children under 18 were three times as likely to consider bringing a baby on a plane very or somewhat rude than people with kids. Forty-two percent of respondents acknowledged that the person in the window seat should control the shade, and 58 percent thought everyone should have a say in the shade’s status. A full 16 percent of respondents had used personal electronics during take off and landing in violation of the direction of flight attendants. And settling an age-old question I’ve always had — do people actually smoke in bathrooms? — seven respondents admitted they had illegally smoked there. There’s opportunity to break these responses down further. You can find the raw data on GitHub.